One of the swaps I've loved most was this one, so I'm bringing it back because there's never enough kindness. We will buy a jar or even better, re-purpose a jar. We can decorate it, or not. That isn't part of the swap. The swap is to cut 10 strips of paper (preferably plain printer paper in light color: white, yellow, pink, orange to keep it readable) and easily fold-able for our jars. On each of those pieces of paper you will write something happy, encouraging, thoughtful, etc. It can be a quote. It can be a tasteful joke. It can be personal note. It should only be a sentence or two so that it can be legible. And yes, it can even be printed/typewritten. You will do this 5 times as you will have 5 partners (50 total strips). When you receive your strips, fold them and put them into your jar without reading them. When you need a moment of happiness, you will have several to go to. You must include a short note to your partner that includes your SB username, and please rate upon receipt. Ask any/all questions in advance. Can we use rubber stamped sayings or quotes? I love this idea! Wonderful idea for a swap, @VivaLaDiane I'm in! Thanks so much. I loved the idea of the swap so much. 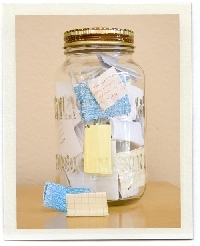 A young person in my life knows I love this concept so much that a jar full of notes from them has been my Christmas gift the last two years and I've never received a better gift. I hope this has a ripple effect of happiness for anyone involved. It's what the world needs now more than ever in my lifetime.